I recently reported from the International Riesling Tasting at Howard Park’s winery in Margaret River, Western Australia. Next day, a small group of us joined with owner Jeff Burch for a blind tasting of Pinot Noir, where Jeff had selected seven Antipodean Pinots and seven Burgundies, including his own wines somewhere in the flights, to be assessed blind. Included amongst the wines were both Australian Pinots and Burgundies under the Marchand & Burch label. This is a joint venture between Pascal Marchand, ex-winemaker at Comte Armand and Domaine de la Vougeraie, and Jeff Burch (left and right of picture). The team makes Pinot in the Great Southern region, with Pascal overseeing the winemaking project that is under the day to day supervision of Howard Park’s Head Winemaker Tony Davis, and bottles a range of Burgundies under the Marchand & Burch label too. Included in this flight were two wines made in Western Australia’s Great Southern region, by the Marchand & Burch partnership. In all the flight had some beautiful wines, and showed unequivocally that Australia is no longer (if it ever was) only capable of making rather big, oaky Pinots: styles here ranged from the soft, open and delicate, through the tight and reserved, to some more robust examples. The notes are from the blind tasting. Lightly spicy, fennel seeds and a touch of coffee and briar. An earthiness to some cherry fruit. Beautifully sweet, mouth-filling fruit. Has a plump red berry opulence, but a nice edge of roughening tannin and some spice – a lot of spice emerging. 91/100. See all stockists on wine-searcher. Like the creamy, soft, balsamic strawberry depth and silkiness of this. Nicely subtle and integrated oak. The palate has a lot of tannin, and a lot of dry extract. There’s a briary, quite grippy character here, with a slightly raw edge of bitter orange acidity. Needs time, but structured and very, very fine. 92/100. See all stockists on wine-searcher. More subtle on the nose, with just a hint of damp earth and quite solid, plummy fruit. The palate has a certain roundness and opulence too – the antithesis of the previous wine in some ways, with the tannins lighter and the acidity much more cherryish. Fine, and refined. 91/100. See all stockists on wine-searcher. Spices and caraway seed exotic hints, with a touch of bonfire smoke. The palate has a juiciness and life about it. Quite dry, orangey, even a touch lean. At this stage lacks a little flesh on the mid-palate, but it has a harmonious finish, and some real cherry and chestnut elegance and polish. (Later learned this is from a biodynamically farmed block). 92/100. See all stockists on wine-searcher. Huge, deep, bold colour – very ‘big’. Lots of mint and dark chocolate and raspberry aromas. Not shy on oak and liquorice extraction. The palate is richly textured and dense, with a real liquorice grip and plenty of dark, grippy, plum and cherry skin grip and fruit. Balanced, but big, and much more of a ‘solid red’ style, but undeniably a good wine and interesting to watch as it ages. 92/100. See all stockists on wine-searcher. Another bold, dark, solid-coloured wine. Slightly more charming nose, with a little fudge-like softness and a hint of truffle. On the palate very sweet fruit – plums and an edge of something like cranberry, with lots of tannins and dry extract, but there’s a gentleness at the core of this. 91/100. See all stockists on wine-searcher. 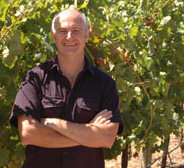 Wines from Marchand & Burch and from some of Jeff Burch’s favourite producers. We were told the first two wines were from the 2007 vintage (which on this small evidence is very promising) and the next four from 2004. A couple of 2008 M&B barrel samples, brought back from Burgundy by Jeff just a couple of weeks before, were added at the end. 2004 was very clearly a vintage where a lot of care was needed, and some of these wines disappointed slightly, but then also produced my highest scoring wine of the tasting. Bright, youthful dark colour. Light spices and cherry fruit. Fairly restrained and subdued, but there’s a sense of sweet-fruited opulence in here. On the palate a lovely vinous, quite dark edge to this, with crisp, well-defined tannins and a spine of very pure fruit hung with subtle, gentle oak. Lovely structure and length. 90/100. A touch of greenness to this, that is stemmy, briary and earthy too with the vinous fruits in the background. The palate is pretty dry. Definitely some big, stemmy tannic grip and dryness here, a touch of coffee and then a big core of orangey acidity. The finish is spicy, and there’s something attractive about this, but it lacks a little mid-palate fruit sweetness and weight for me. 89/100. See all stockists on wine-searcher. Quite herbal and even lightly medicinal underripe notes here. A touch of chestnut and cedar. Warming spice behind and a dark fruit quality. There is a core of berry fruit to this wine, with redcurrant and a hint of something juicier and sweeter. The palate has a lightness and lithe quality – maybe lacks a touch of structure for long ageing, and the fruit waning slightly just on the finish, but harmonious and elegant. 90/100. See all stockists on wine-searcher. Solidly earthy and coffeeish, with a touch of briar and greener qualities, some cardamom and fennel spice. 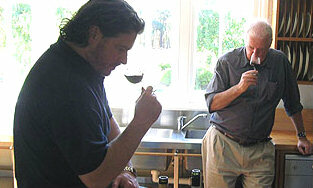 The palate has a big, solid, quite chunky core of tannin that is grippy and forceful. It is slightly overpowering the fruit, but there is a berry fruit there and a big, coffeeish finish with the warming oak adding a bit of breadth and filling it out. Needs time. 92/100. See all stockists on wine-searcher. This seems to be very harmonious and together on the nose, with nice integration of oak with the ripe, dusty cherry fruit. The most fruit-forward of the wines, but very classy. Lovely oak. The palate has really beautiful fruit too. There’s a seam of tight black fruit, fine gravelly tannins and lovely finesse. My wine of the flight. 95/100. See all stockists on wine-searcher. A barrel sample brought over by Jeff Burch one week ago in his hand luggage. Strikingly fruity: very bright and vivid, delicate floral perfume. Quite tightly structured on the palate, good fruit and definition. This should come good. Another sample brought back from Burgundy by Jeff. Warmer, earthier, with a richer character, and again a very tight liquorice-edged, refined fruit that is also powerful. Has terrific potential. 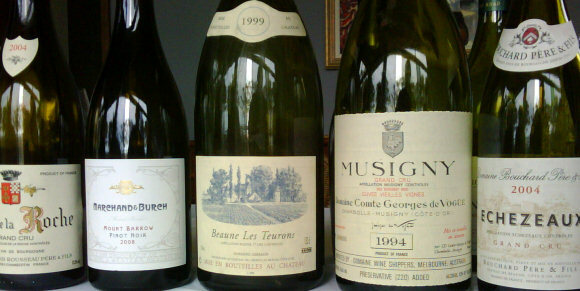 below: wines from flight two (plus a couple of magnums we enjoyed with lunch afterwards).